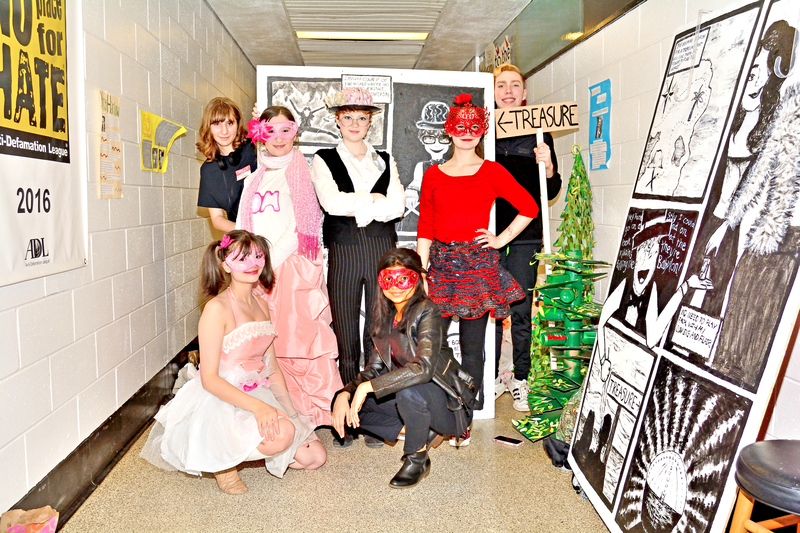 Pennsbury kids step up at Odyssey of the Mind tournament - Times Publishing Newspapers, Inc.
Pennsbury will once again be well-represented by its students in a state competition following the kids’ performances in the southeast regional Odyssey of the Mind tournament on March 2nd. This marks the 35th year Pennsbury students are participating in the annual, creative problem-solving competition. “It teaches many leadership skills,” PHS junior Nina Lane said. Like many of her teammates, Nina, 16, started competing on Odyssey teams in middle school. “It is an outlet to learn things and be creative,” she said. More than 150 Pennsbury kids on 24 teams, representing all 14 district schools, competed in the regional tourney at Pennsbury High School in Falls. The non-profit Pennsbury Odyssey of the Mind Association provided support for all the teams before and during their contests. The Pennsbury kids were among more than 600 area students in kindergarten through 12th-grade who participated in the daylong, all volunteer-run regional event. Up to seven students were on each of the more than 100 teams in the competition. The teams could solve one of five challenges. Problem #1 was “OMER to the Rescue Again,” Problem #2 was “Hide in Plain Sight,” Problem #3 was “Classics…Leonardo’s Workshop,” Problem #4 was “Structure Toss” and Problem #5 was “Opposites Distract.” A sixth problem, “Museum Makers,” was available for K-2nd grade teams to solve in a separate Primary division. An explanation of each problem is at www.odysseyofthemind.com/our-problems/. Participants competed in either the elementary, middle or high school divisions, based on their grade level. Students were challenged to use science, technology, engineering, math and the arts to solve their chosen problem. Team members began last fall to meet a couple times each week to devise a solution and create an eight-minute theatrical performance to present to volunteer judges at the competition. The Afton Elementary School Problem 1 team combined “Harry Potter” and “The Wizard of Oz” to present its solution to the “OMER” challenge. The kids called their performance “Omerdore and Hagrid’s Adventures.” They created intricate props and outfits for their presentation, including witches hats made out of plastic utensils. “It felt exciting,” team member Anna Cheeseman, 9, said. The Afton team captured first place in Division I of the “OMER” category to qualify for the state tournament. Whether they qualified for states or not, area students who participated in the regional event welcomed the chance to compete. “I like to build, be creative and use interesting materials,” said Matthew Koptyakov, a seventh-grader at the Pen Ryn School. Matthew, 13, and his teammates at the private school in Falls focused their performance on a battle between fruits and vegetables in the imaginary “Kingdom of Nutrition” while competing in Division II of the “Opposites Distract” category. The Pen Ryn team took home seventh-place honors. James Douglas Watson, a seventh-grader at Pennsbury’s Charles Boehm Middle School in Lower Makefield, said he also got a lot out of the experience. He and his Problem 1 teammates competed in Division II of the “OMER” challenge. “You can really just let your mind run wild,” James, 13, said before he and his teammates presented an “OMER Mobile” they created to prevent antagonists from entering their imaginary city. The Boehm Problem 1 team finished third in Division II of the “OMER” category. Typically only the top two teams in each division of a problem advance to the next round of competition, said Jim Howarth, a spokesman for the Pennsbury Odyssey of the Mind Association. However, in certain instances, like in this year’s Problem 4, a third place finish also qualifies a team to advance, he said. Pocono Mountain High School will host the April 6th state tournament. Dozens of Pennsbury students will be working their creative energies on that day for the chance to go to the 2019 Odyssey of the Mind World Finals in May at Michigan State University. In addition to the Afton Problem 1 team finishing first in Division I of the “OMER” category, the PHS Problem 1 team advanced to states after finishing second in Division III of the regional challenge. Also advancing from the “Hide in Plain Sight” regional competition is the William Penn Middle School Problem 2 team, which captured first place in Division II, the Edgewood Elementary School Problem 2 team, after it captured second place in Division I and the PHS Problem 2 team, which finished second in Division III. The Pennwood Middle School Problem 3 team captured second place honors in Division II of the “Classics…Leonardo’s Workshop” category to also advance to states. And in the “Structure Toss” category, the Makefield Elementary School Problem 4 team captured second place in Division I and the Pennwood MS Problem 4 team won third place in Division II to continue competing. Results of the Odyssey regional competition are posted at http://sepaodyssey.org/.